Welcome to 40 West Arts District, home to many eclectic talents, and the juxtaposition of glitter and grit on West Colfax Avenue. Reminders of Lakewood, Colorado's storied past can be found at the relatively new light-rail stop, Lamar Station. Bricks at the base of a work of public art titled Lakewood Legacy Trees, created by Lonnie Hanzon, are etched with historical details: In 1916, "West Colfax Avenue paved for automobile traffic." In the 1930s, "West Colfax tourism industry takes off." Other bricks note, for example, the founding of longtime exemplars of gastronomical Americana -- such as Davie's Chuck Wagon Diner and Casa Bonita. 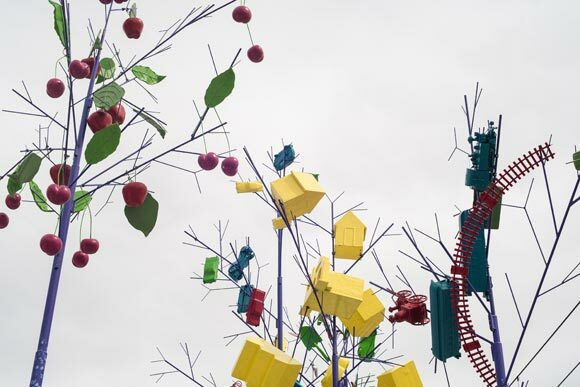 From this brickwork timeline, fanciful trees rise up, trunks inlaid with colored glass. The branches bear fruit: little yellow suburban houses, trolley tracks, garden implements and automobiles, in addition to orchard-red cherries and apples. The artwork's immediate surroundings include an apartment complex or two, but the area remains largely industrial, with trucks loudly chugging by. Yet the side of a building sports a mural of two gaily colored hummingbirds, their beaks meeting. On utility boxes, lively cartoon figures, designed by artist Buddy Bravo, urge people to "Paint" and "Dance" and "Connect." At a roundabout a block up stands another example of Lakewood's expanding public arts. The sculpture, which dominates the roadway, lights up at night in colorful shifting patterns: Connected, completed in 2015 by Christopher Weed, depicts four interlocking pieces of a jigsaw puzzle. 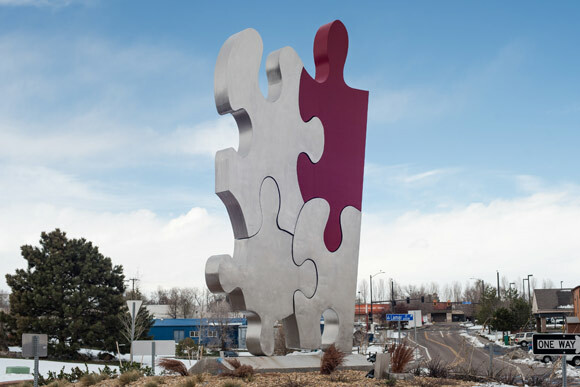 Like jigsaw pieces fitting into a puzzle, what does the bigger picture reveal when it comes to art in Lakewood? Could it be a future where art is celebrated not only within galleries and studios but boldly along the the traffic medians of West Colfax, as well? A place where a vibrant arts community both lives and works along this longstanding traffic corridor? A city where artists, not just artworks, are held up as integral to a prosperous community? That's the hope of Bill Marino, as well as the members of the organization that he directs: 40 West Arts District, a state-certified Creative District. Marino is a businessman, a networker-wrangler, a civic booster, an art devotee. 40 West Arts District runs along West Colfax and its adjoining blocks, roughly from Sheridan all the way to Simms. Within its boundaries lies the campus of Rocky Mountain College of Art + Design (utility-box artist Buddy Bravo graduated from the school), as well as assorted galleries, studios and creative businesses. Marino says, "We formed in 2011 as a district, we became an Emerging District in 2012, and then Colorado Creative Industries designated us a Certified Creative District in 2014. . . . It was a rigorous process to become a certified district. We had to demonstrate how we embraced the authenticity of our community, how we're engaged with the community, how we've built it in a way that it can be sustainable into the future and everything to do [with] volunteerism to artist engagement to funding." Bill Marino, director of 40 West Arts. As Marino points out, West Colfax -- a.k.a., Highway 40 (which once ran from Atlantic City to San Francisco) -- used to be the "Gateway to the Rockies" from the East Coast. Marino says there were supper clubs, dance clubs and motor inns along a roadway that was just as legendary as (and which had preceded) Route 66. A neon paradise. Then I-70 came along and set West Colfax asunder: "This area went into a 30-year decline," says Marino. Now Marino envisions a "renaissance of West Colfax" -- with its newly minted arts identity leading the economic charge. Marino says, "There's going to be big gateway features welcoming you to 40 West Arts District . . . giant art installations in the median on West Colfax, one on the east end and one on the west end. And then there's going to be signage and wayfinding, [so] that people will be able to tell that they're in someplace unique." Marino points to progress in the arts district: "We started with one gallery, and then there was five, and then there was seven, and then there were 10, and now there's 12 and more coming. So it's momentum, energy." Clearly, he takes pride in an area that has suffered its knocks over the years, that continues to deal with the challenges of crime and poverty. "West Colfax has its own unique story, its own legend, its own lore," Marino says. "You know, it's a juxtaposition of glitter and grit." On a stretch of Colfax where walking is practically regarded as an aberrant form of transportation, automobile and motorcycle traffic provide a ragged waterfall of sound. Near Teller Street, there's a drive-thru liquor store, a medical marijuana shop, a massage business with a neon sign and pawn shops offering cash for guns. It's where Colfax's storied grit has also turned a bit dusty over the years. At 40 West Gallery's recent juried exhibition, Characters of Colfax, a variety of artistic styles hung on the walls: a mixture of fine, folk, craft, mainstream and outsider art. The fact that the exhibit attracted paid entries from artists outside of Lakewood testifies to the gallery's spreading reputation. Jean C. Wilson, from 24 miles east in Aurora, displayed her playfully designed puppet-tambourines made from polymer clay as well as recycled materials acquired from Habitat for Humanity. Wilson says of the exhibit's attendance, "It's amazing the amount of people that show up for [First Friday]. And even on Wednesday, it was very busy." When asked what 40 West Arts District means to his city, Mayor Paul replies, "I would say it's a renaissance of 40 West, of West Colfax Avenue, [which has] been kind of tired for [a while], and there's this rejuvenation and energy that's really come from the community that's amazing." Adds Paul: "This is community-led: It's not top-down, it's grassroots-up. I tell people, 'Come to West Colfax, see the energy!'" It's a West Colfax sentiment echoed by former Lakewood City Councilwoman Cindy Baroway, who's been instrumental in city planning incorporating the arts: "This is where the energy's at, this is where the vibe's going to be." At Lamar Station Plaza (formerly known as the JCRS shopping center), Casa Bonita is still the big pink attraction in a rebranded strip mall also housing an ARC thrift store, a tax service, a nail salon and two different dollar stores. Potholes pepper the parking lot. But under new ownership these days, there's something else happening here: creativity. Lamar Station Plaza is the new home of the Lakewood Arts Council, which offers art classes as well as a couple of galleries inside its space. And there's a business dubbed the Gallery of Everything, where co-proprietor and jewelry-maker Lauri Ennis says that 250 people recently showed up for its opening ceremony. It's a great spot to pick up, for instance, art supplies, tchotchkes, paintings, carved walking canes, glass pipes, a decorative birdhouse, or an antique dental X-ray machine. Naturally, Ennis says, "We try to have a little bit of everything." Due in part to Bill Marino's influence, it seems like everyone is taking part in promoting 40 West Arts District. 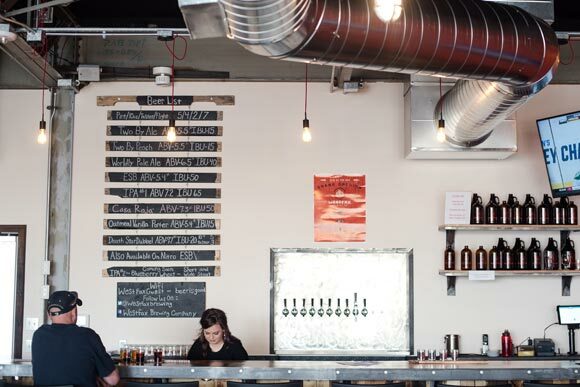 WestFax Brewery just opened a couple days beforehand, but owner Anthony Martuscello says it's already gearing up for pouring its, say, Abbey Ale or Oatmeal Vanilla Porter at the upcoming West Colfax MuralFest, which was reportedly attended by 2,000 people last year. Other nearby businesses that display district artwork include Sweet Bloom Coffee Roasters (paintings) and the Abo Group architectural firm (sculptures). Marino says of 40 West Arts, "We're known for our partnering." "The West Colfax Corridor is a remarkable convergence of opportunity -- new zoning put in place by a forward-thinking City, the catalytic impact of light rail, active advocacy by the Lakewood-West Colfax [Business Improvement District], fresh creative energy from 40 West Arts, [the Rocky Mountain College of Art + Design], and new creative enterprises converging on the area, and the quirky history that makes Colfax cool. With all this lining up, West Colfax is poised to be the next big thing in metro-area real estate!" In tune with its state-dictated mandate, Marino says the 40 West Arts is taking steps to avoid artists eventually being pushed out due to gentrification. Presently, the district leases a building -- dubbed 40 West Studios -- which provides cut-rate studio space to a number of artists, with more artists on its waiting list, and perhaps more buildings to lease on the horizon. Marino cites another coup for the district: "We're going to have an enclave, a community-artist enclave, that's [going to be] built by Artspace, which is the largest developer of artist live-work space in the nation. So you could live there, work there, have your studio there [and there's] galleries in it. They have 39 projects across the country. They came and evaluated us, and we had to go through a variety of feasibility studies, market demand studies, and they've selected us as a next destination." Art at 40 West Arts Gallery. At the district-run 40 West Studios, an eclectic mix of artists presently occupy spaces, side by side. Vikki and Brian King collaborate on art designs featuring images of Ouija boards, in addition to working individually on paintings and photography. A self-described "art activist," Brian King says, "Being a designer for over 50 years -- products for Apple, Motorola, IBM, National Instruments -- I looked around at our common culture and saw certain symbols in our culture that needed to be redesigned. One of them was the Ouija board from the early 1900s." How have the Kings been treated by the arts district? Brian says he and Vikki joined 40 West Arts when it was still a "baby." King observes, "We were treated like a baby would treat us: with open arms, full of love, innocence, and kindness," he continues. "And, as it grows, we help form its personality through treatment or mistreatment – so we make sure we treat it well. So, I only have good words for it, because I want to see it grow up to be a good citizen, you know?" King continues, "I have a personal viewpoint, too, which is separate from that. And that personal viewpoint has to do with integrating artists into the community. Now, a lot of people talk about integrating 'arts' into the community -- but it's about artists, it's about people. Corporations should not do well because there's lots of artists; artists and corporations should do well because there's lots of artists. We are not here to bolster the sales of the local tire company. Gentrification. We are here to make a culture. Artists interpret the past, reflect on the present, and envision the future. That is our job: to design this culture." It's a sentiment shared by Cynthia Haase, whose studio sits across the hall. "I believe that art really creates the civilization," she says. With a warm welcome, Haase invites a passing visitor into her workspace. It would be tempting, perhaps cliché, to say that Haase's paintings of fruit "glow from within." Rather, there seems to be palpable sense of love directed by the artist at what would otherwise be prosaic still life subjects -- instead of vibrant treasures. Additionally, she creates engaging abstract works. Haase, who lives in Arvada, previously resided in Lakewood for 15 years. She's a former president of the Lakewood Arts Council, and the current marketing director for the national organization, the Color Pencil Society of America. When Haase lost her husband at the beginning of 2015, she asked herself, "What am I going to do with the rest of my life?" She began looking for art space, for a new locale: "I went to Loveland, I went to Council Bluffs, I called Seattle, I called a couple others. And then I heard they were going to do art space here. And I thought this would be a great experiment: to see if I like to be in a space with other artists, and if I could make that work for me artistically. I absolutely adore it! It's probably the best thing I've ever done." What has leasing a studio space in 40 West Arts District given her? Perhaps, the same thing that artists like Haase are giving back to Lakewood, Colorado's West Colfax neighborhood. "I find that I have a new lease on life," Haase says. Photos by Kara Pearson Gwinn. Graphic design by Matt Megyesi. This story is part of a series about Colorado's Certified Creative Districts. Support for this series is provided by Colorado Creative Industries. Faye Crowe works as an architect, designing as well as adorning high-end custom homes -- from their structures to their interiors, and she even suggests art for the project. She's also a painter. Crowe maintains a studio in the 40 West Arts District on Teller Street. Confluence Denver: Tell us about your architectural work. Faye Crowe: These current clients I have, I'm like their family. Each job is so personal and unique. I work with an existing site; I very seldom have a flat site. It's a very creative three-dimensional equation. In Larkspur, I'm actually designing a house around the existing boulder. Within the master bath, there's an existing boulder onsite. I've had an artist come in and carve out this boulder for the shower; the tub sits against it, and they've carved out a bench. CD: When did you begin painting? FC: I started about 10 years ago. It was a rebellion against the computers. I need a huge, creative outlet. Architecture was not enough, so that's what I do for fun. CD: Sometimes you paint on large pieces of cardboard, which produces an interesting stippled effect. FC: I like to experiment a lot, and I like to play with different materials. The guy behind me, his glass company gave me this thick cardboard. So I paint on that. People love that. It's not archival: It has to be protected behind glass if you want to keep it for 100 years, but 20 years it'll probably be fine. I like it because the cardboard gives it a lot of texture. CD: Who are some of your influences? FC: Leonardo da Vinci. Very mathematical, but also he was pretty well-rounded. He did a lot of different things. Nicolai Fechin. He's a Russian artist who was incredible. I studied down at the Art Students League of Denver with Michelle Torrez, a fabulous, figurative artist. 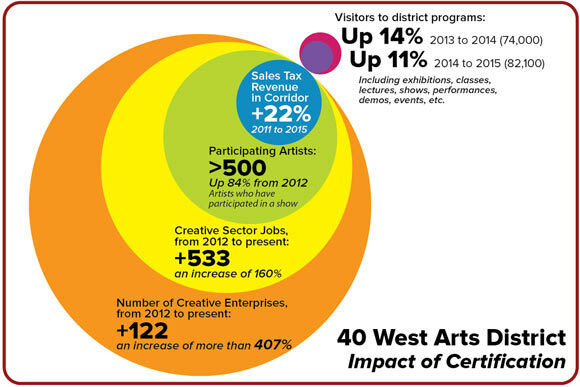 CD: How did you get involved with 40 West Arts District? I understand you were once on the Lakewood Planning Commission. FC: I was really involved in the Colfax corridor for years. When I heard about the art district, I came back in. Once at meetings, they immediately talked me into moving my office here. I've been here just over two years. It's a young district, it's up and coming. You definitely sense that they care. They really want to see the district succeed, so I think they try so much harder. Like First Friday, the mayor came, the city council came. People commented, "We can't believe the mayor came, that this means that much to the city that we see the mayor and city council come to these events!" Artists feed on each other, and that was really important about being in an art district: networking with other artists. It's nice to have that input.